This entry was posted on March 13, 2012 by Megan @ When Harry Met Salad. It was filed under baked goods, eggs, dairy, & cheese, fruits & vegetables and was tagged with big sur bakery cookbook, citrus, custard, grapefruit, pudding, pudding cake, souffle. Oh, wow! This looks amazing. 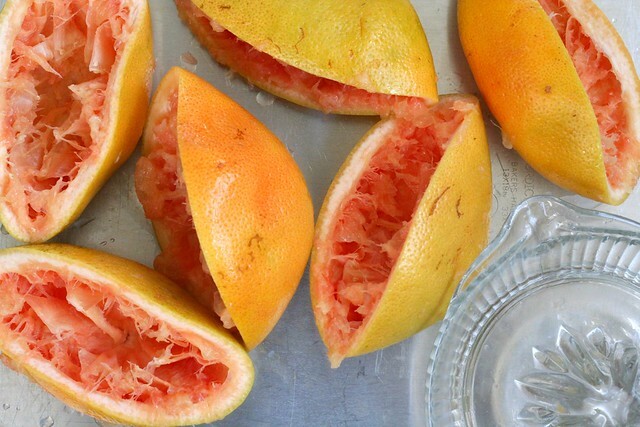 Grapefruit is surely one of my favorite fruits and I never knew what fun would be done with them! But this! Looks so great. Thanks! I love grapefruit this time of year, but I rarely just eat them. The cookbook club is pretty awesome, actually. It’s like any other book club, only the books are all cookbooks. We meet about every other month and pick a new cookbook each time. We plan a menu prior to the meeting, and then as people arrive they get copies of a recipe to start working on. Over dinner we chat informally about the book (and other stuff). 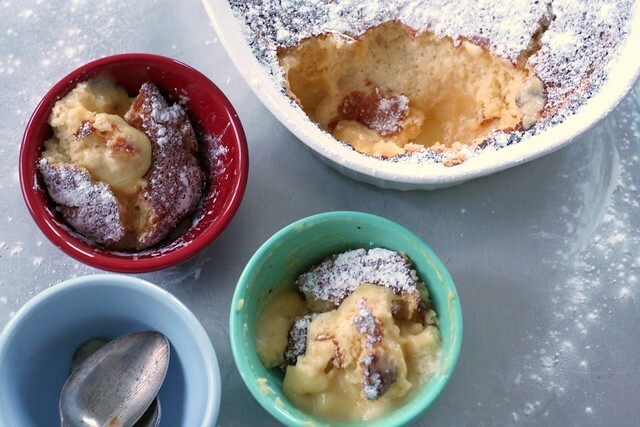 And when we did Dorie Greenspan’s book last winter, she called us during dessert! I second on the cookbook club!!! What a great idea! Looks so good, and not to complicated….is creme fraiche french for fresh cream? Gorgeous photos! I love seeing the process of the recipe in the squeezed grapefruits! This looks delish! love the crunchy top it forms. 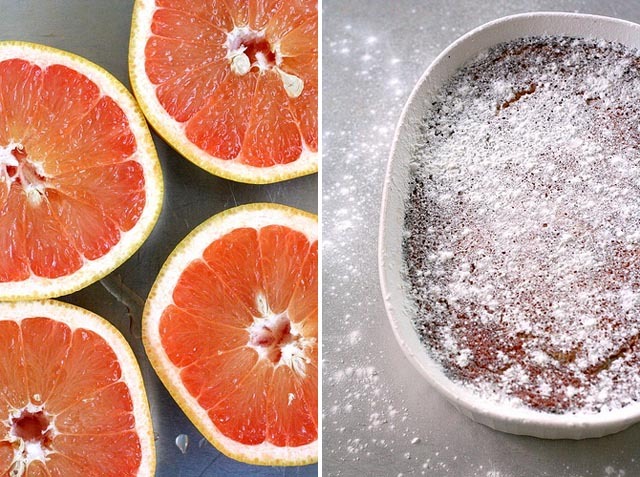 This post caught my eye on Recommended as I adore grapefruit but never eat it enough. This is the best thing I’ve seen all week, I then scrolled down to find yet more amazing recipes. I am officially coveting your blog. You now have a new UK based follower :) I’m looking forward to trying this puppy out at the weekend! Your photographs are fantastic; are you a professional food photographer? wow that texture of the pudding is perfection. Looks very very nice indeed. I can see that you haven’t been posting lately, but I hope you’ll start again. I found your blog shortly after starting mine, and you have wonderful stuff here. Not to mention that I love the way you write! Annnnd, I’m back. 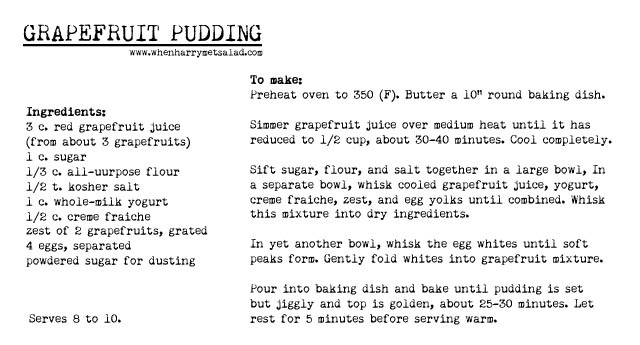 Looking at this grapefruit pudding recipe and it looks amazing. I have to get my husband to try this! What an idea! And you thought you’d seen every kind of pink this time of February… here’s a new one (at least to me) with zing. 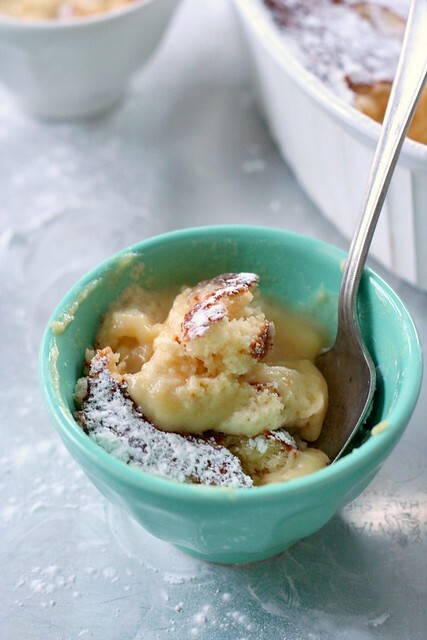 Do you have other ideas for an unconventional Feb. 14 dessert? This one’s also off the beaten chocolate-track (not that I have any problem with that path : ).